A Magical Ending… Matthews wins 7th National Title! Jamaica's #1 player Shane Matthews is commonly known to other Jamaicans as "The Magician." It is a reference to how he is able to perform tactical brilliancies and often squirm out of precarious positions. Again, Matthews had to perform a brilliant escape trick in order to avert a last-round loss to Duane Rowe in the final round of the Jamaican Championship. Both players had 8½-1½ and this match was for the title! The Jamaican crowd had gathered to observe the exciting spectacle. After Matthews outplayed Rowe in the opening, it appeared he would cruise home to victory, but after the game took a sharp turn, all bets were off… Matthews was now fighting for his life! Rowe, who arrived 27 minutes late (due to the weather), had veered in tremendous time pressure, but had done a wonderful job in complicating matters from a bad position. However, in the heat of a fierce time scramble, Rowe missed mate in two! Matthews' poise allowed him to squirm away once again! The spirit of this battle is far beyond what happened on the board. Matthews took home an unprecedented 7th National Championship and has shown that he is an amazingly durable player. 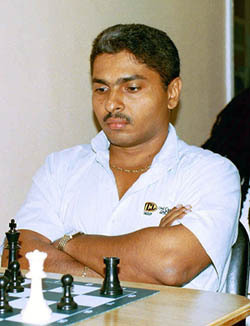 He has certainly cemented a place in Jamaican chess lore for years to come. In addition, Rowe is to be commended, not only for his fine performance, but for showing so much courage after suffering a personal tragedy. The Chess Drum salutes both Matthews and Rowe for their valiance and fighting spirit! Also JCF President Ian Wilkinson and the Jamaican Chess Federation are to be commended for hosting such an exciting event. Last but not least, gratitude is extended to KRY$ Financial Software Company for sponsoring the successful event. Congratulations to Jamaica! See Rowe-Matthews, 2003 Jamaican Championship.